ROME, Sep 15 2016 (IPS) - Hardly a street can be found in Rome without a Bangladeshi-run mini-market. Much like the typical Italian coffee bars, they have now become an intrinsic part of Roman infrastructure. So embedded have these “Bangladeshi mini-marts” become in the Italian capital, one would struggle to think as to how this wide chain of Bangladeshi businesses exploded across Rome and so rapidly became a vital component of the city’s amenities. Proud Bangladeshi shop-owners supply customers with fruit and vegetables, basic groceries and toiletries, their bright “open” signs ever-present ,even on Sundays when the majority of Italian shops remain closed. 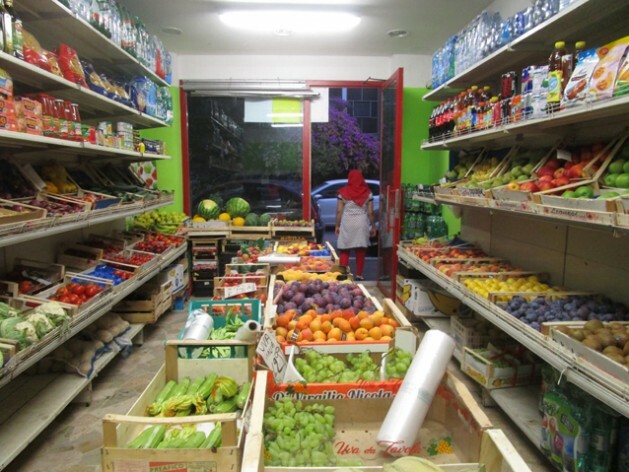 Through the buildup of these small businesses, Bangladeshi migrants have achieved what no other migrant community in Italy has: they have managed to take over a niche in Italy’s economy, attracting Bangladeshi and Italian customers alike, providing long opening hours, all year round. Not only have they learned how to be successful in a foreign country, not to mention mastered a foreign language so far removed from their Sanskrit-rooted Bengali – they are also providing for their families in Bangladesh, sending remittance money home every month to support their relatives. In most cases, the journey they must endure to arrive in Italy is risky as many travel as illegal immigrants. The life they live in their new home is a far cry from the idyllic image of Europe they are exposed to in Bangladesh. Oftentimes, their migration is met with economic hardship and suffering. Bangladeshis have remitted nearly 1 billion dollars from Italy between 2000 and 2010, according to Bangladesh’s central bank. Migration from Bangladesh has been ongoing since the country’s formation in 1971. The high oil prices in the 1970s boosted industrialization in the Middle East, and created a new migration system drawing mostly on north African and south and southeast Asian laborers. Then as today, it is poverty and high unemployment which drive many Bangladeshis to migrate: “Male members are invariably expected to migrate to cities or overseas to uplift the family financially” Dr. Mizanur Rahman, senior research fellow in migration studies at the National University of Singapore, told Al Jazeera. Over time, Bangladeshis began to migrate to Europe no longer wishing to withstand the harsh working conditions prevalent in the Middle East. Within a few months, a small group of around 300 Bangladeshis living in Rome in late 1989 had increased its size by an estimated twenty-fold. Since then, the community grew even further as a direct result of undocumented migration. By 2009, 11’000 Bangladeshi migrants were living in Italy on unverified documents, the Italian Bureau of Statistics (ISTAT) states. Newer estimates suggest that their number could now have risen to 70,000. “I went through India, Thailand, Russia and Spain. At each airport, I paid approximately 150 Euro to officers in order to let me through. I was told by my sponsor that this form of bribery would always fare well in the airports of certain countries.” Amit says. After Britain, Italy has the second largest Bangladeshi community in Europe, its residents counting up to 122,000. In spite of no historical or cultural tie shared between Bangladesh and Italy, the presence of Bangladeshis in the South European country continues to grow at a steadfast pace. The reasoning behind this mass migration can be considered as a process of globalization wherein ethnic communities establish themselves with growing rapidity in other parts of the world primarily triggered by the promise of economic opportunity. Italy is an especially desirable destination for Bangladeshi migrants, due to its lax entry controls and its beneficial initiatives to legalize migrants. Dr.Rahman emphasises. Throughout the 20th century, a dire lack of opportunities in Italy led to the mass emigration of its people. A high number of Italians were obliged to search for better livlihoods abroad. As the primary focus rested on emigration, Italy paid little heed to the new phenomenon of immigration. Consequently, no effective immigration policy was implemented until the 1980s and the regulation of foreign entry into the country only began in 1986. In 1990, now more familiarized with the concept of immigration policy, Italy introduced the Martelli law which offered immigrants the opportunity to regularize their presence. Under the Martelli law, 217,000 immigrants emerged from their illegal status and were permitted entry into the Italian labor market. The law stimulated migration into Italy, and enhanced family or kinship migration and opportunist migration. Bangladeshis usually participate in the Italian economy in three ways: as employees, street-hawkers and entrepreneurs. In Rome, they tend to work in the service industry or in construction. They often work as assistants on market stalls or as newspaper distributors. The street-hawkers who have become such a prominent feature on Roman streets sell a variety of wares such as lighters, tissues, car fresheners, flowers, toys or jewelry. In many cases, the entrepreneurs open up mini-markets or internet cafés. “I began my work in Italy as a street hawker selling small toys. Now I work in the store of my cousin, he runs the business”, Amit explains. Amit’s dream is to save enough money in Rome with the hope of returning to his homeland. He believes with the money he earns abroad he can eventually lead a prosperous life in Bangladesh. “A life better than the one I had before I came here”. Amit says. However, the money Amit earns only partly goes into his savings. Like many other Bangladeshis, he sends some of it back to Bangladesh: “I send money home to my parents and my wife’s family every month.” he explains. The Bangladeshi government, aware of the value of remittances sent by its people from abroad, encourages overseas workers to send the remittances through official channels. With this reasoning they established the Wage Earner’s Scheme (WES), which offers favorable exchange rates to Bangladeshis living abroad. Undoubtedly, the Bangladeshi community in Rome acts as a strong, united force. However, over the last few years, it has taken on a hierarchical structure, and it has become difficult for newcomers to establish themselves and get jobs outside of the submerged economy which mostly involves street vending. “Because our community has grown so much, it has become very competitive. A lot of Bangladeshis have become envious of those who have set up businesses and eventually become successful like my cousin” Amit says. Even though they both make enough money at the grocery store to help support their families, Amit and his wife do not envision a future in Rome.